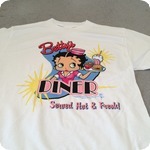 Betty Boops Diner on a new extra large white tee shirt. Front only with sizes in small, medium and large...email me if you want one of the other sizes. This the last of this print, a collectible for sure.